There have been widespread road closures due to flooding, including I-25 in both directions from Denver to the Wyoming state line. In my experience, any disruption that affects a road will affect a railroad to some extent, with an emphasis on proximity to the source. This holds true for this week's craziness. Greeley--I've just learned--is inundated. While Colorado has had occasional and rare stretches of showers and overcast skies, the rainfall this week has shattered records. In some places, over half a year's worth of rain fell in a few short days. No one I know can recall this kind of flooding ever happening here. Ever. Erosion fascinates me. Water under pressure does amazing things. Canyons thought to form over millennia can happen within days, as witnessed on Mt. Saint Helens, given the right pressure, viscosity and debris. Dams thought secure can overtop and within minutes begin to tear open. And as witnessed this week on network TV, roads can be eaten out from under cars while people sit inside unaware and in grave danger. Considering the weight of locomotives, cars and cargo, imagine what a pair of rails need to stay solid. Railroads are only as good as the ballast beneath them. Still, there's something else I noticed today. The northern half of the Front Range Urban Corridor is highlighted. When you look at the state's railroads, perhaps the most densely developed railroad corridor is the northern Front Range, the piedmont between Denver and Wyoming, and ground zero for our disaster. Clearly, the worst place to have a flood in Colorado--as far as rail is concerned--is right there. It's development fueled the 19th and 20th century economies for Colorado and the rest of the mountain states. History runs thick. 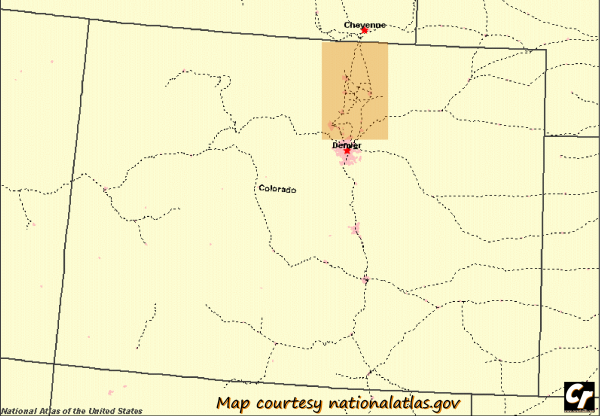 This area saw the first rail connection for Denver and the then-Territory of Colorado with the rest of the nation on the Pacific railroad. These rails served the introduction for thousands of travelers making their way to Colorado for a holiday or a new life to settle as a pioneer. Ironically, Amtrak's Pioneer traveled the same rails, but in the opposite direction from Denver northward to Seattle until the early 90s. Since then, only the California Zephyr continues to grace Denver's presence. While Amtrak hasn't issued any information regarding the status of the daily Zephyr, both Class I railroads in Colorado have issued statements. Union Pacific issued a statement yesterday regarding the impact of the storms, indicating a likely delay of 24 hours for the affected areas including Limon, Colorado Springs, Commerce City, Rolla and Greeley. The track at South Colorado Springs, Colorado is out of service due to washout. South Colorado Springs, Colorado is approximately 72 miles south of Denver, Colorado. The main track is expected to return to service later this evening, Friday, September 13, 2013. The tracks at Boulder, Colorado and Loveland, Colorado are out of service due to multiple washouts. Boulder, Colorado is approximately 30 miles northwest of Denver, Colorado, and Loveland, Colorado is approximately 52 miles north of Denver, Colorado. No estimated return to service has been issued yet. Customers between Broomfield, Colorado, and Dixon, Colorado, will not be serviced until track is restored. You can bet the MOW gangs are going to have a time making the weak sections solid again.